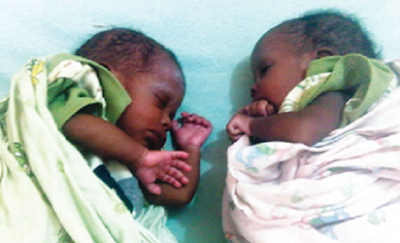 Mr. Adeyemi Ademola, father of the twins abandoned by their birth mother at the Felken Maternity Centre, Lagos, has vowed not to take back his runaway wife, Sarah, even as he plans to relocate from his current abode. Ademola who bared his mind yesterday at the Pedro Police Station, Somolu, where he had gone to claim the babies, said his wife deliberately deceived him that she had only two children whereas she already had six. The abandoned twins It would be recalled that Sarah reportedly fled on the 16th December, 2016, abandoning her newborn babies almost a fortnight after birthing them on the 3rd of December, 2016. The estranged mother, when contacted, claimed her disappearance from the health facility was as a result of her husband’s inability to settle the hospital bill. After the news of their inability to offset the hospital bill circulated, Good Samaritans rose to their aid and settled the outstanding bill. Cuddling the newborns in his arms, he dismissed reports that Sarah had returned to him, even as he pleaded for assistance from Nigerians for their upbringing. Ademola said: To set the records straight, my wife has not showed up since she fled on the 16th of December last year. Now that that Good Samaritans have intervened, by paying the remaining balance on the N150,000 bill, she is willing to come back. My question is, coming back to do what, when she had already said she didn’t need the babies. Coming back to the children could be very dangerous, so we are not going to take her back. All we need is assistance from Nigerians to raise the children, he stated. When contacted, the Matron of the Centre, Gloria Akinbobola, said they decided to release the babies on Saturday.